People Schematics Early Era (1935-55) Chilton Era (1956-60) Estey Era (1961-63) Custom M Series (1964-67) SS (1967-68) New Magnatones! New for Fall 2013, a complete guide to Magnatone guitars and the stories behind them! This site is made available as a reference for Magnatone Amps. 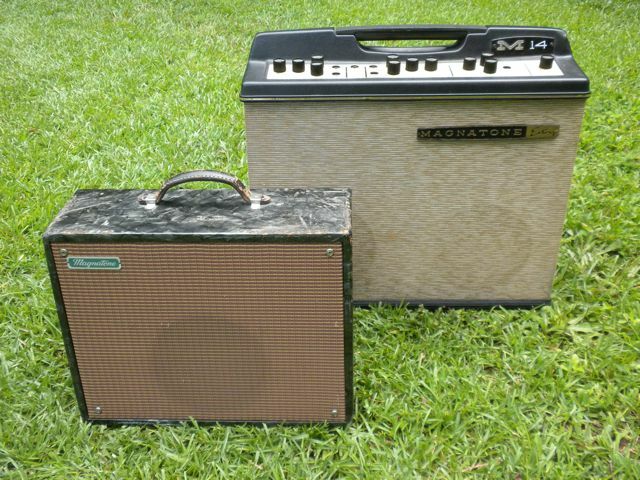 The main product of my research is The History of Magnatone Amplifiers and the short bios that go with it. Jensen, Muter, Oaktron Oxford and Permoflux. This site is not meant to be the final word on these great amps, please contact me with corrections or additional information that you feel would benefit the Internet community. Furthermore, the strength of my knowledge about these amps is centered around the Custom Series amps. If you have useful information for any Magnatone amp to share with other Magnatone fans, Please contribute!! Except where otherwise noted, text/written content on this site is licensed under a Creative Commons Attribution 3.0 License.